REAL Highlander TV series katana. Discussion in 'Replica Props' started by DavidS, Nov 3, 2005. I hear a bit of talk from time to time on this forum about swords, but havent heard Highlander mentioned much. I just wanted to take this opportunity to plug a good friend of mines site. His name is Sal D'Aquila the prop maker for the first season of the highlander TV series. As true fans will know, the sword that duncan used in season one and part of season two was different from the later (crappy) stainless steel bladed Marto "sword of the dragon". This First season sword was designed and made by Sal D'Aquila. He offers this handle for sale on his website mounted on high quality, tradtionally made japanese style blades made by Paul Chen. They are fairly expensive in the general sword world, but for a strongly built peice of art such as this, they are well worth it. I have a Musashi - S and love it. Really is a work of art. Must have mine close to 2 years now maybe? Not even sure, time moves so fast, but its close to 2 if not over. Great looking wakizashi David. Know if Sal is interested in doing any more of those? I'd love to turn my one Katana into a set. the Musashi S was made with the shinto blades. The newest Shintos have Bo Hi (fullers) so it wouldnt match for you. Awesome work - may need to save for one and soon. Sal's a great guy and you really need to see the High-Scale Blades he is doing now. I have a Musashi S and I am hoping he will re-do Sword#182 I think it was. If I had seen that I would have bought it on the Spot..
Beautiful blades. They're incredibly cheap too considering they're hand forged, and traditionally clay tempered too. Is the steel also folded? If so then these must be the cheapest authentically forged blades I've ever seen. Very cool. hey Paul chen blades are made in China, so the production costs are low for what they are. Their regular line of swords are sorta hit or miss on quality, but Bugei.com carries an exclusive line of folded Paul Chen Hanwei swords that are really superior. 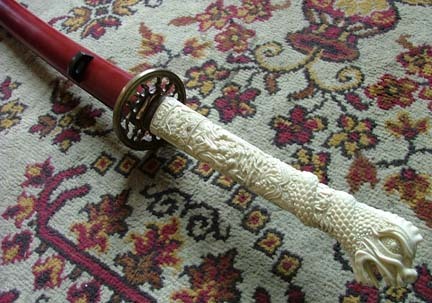 The "regular" blades that Sal uses on his musashis are the "practical katana plus" blades, which are pretty nice, and he does inspect them so your sure to get a nice blade, but the "limited edition" ones hes doing now on the high end blades are super nice...... i cant wait until i get my #182 Bushido Musashi....... OOPs. i didnt say that..?.? Cool. Until I can spare about 25 odd grand for a blade forged by a Japanese master (one day I hope.) these sound like a pretty decent option. hey bud. i have it. it was one of my first swords. the only reason i call it "crappy" is because Ive spoken with Sal, and i get the impression, he sorta got the ruff end of that deal. As far as Sal getting the 'business' of course he did. Davis-Panzer gave EVERYBODY including Adrian Paul the 'business' on that Series. Post some Pics of 182 when you get her. Be glad you saw her before me or it would have been me doing the laughing. I know this is off topic, but I have to tell it. Yesterday, my mother was over visiting and she mentioned she was going to a farmer's market. She asked if I needed anything, and I of course answered "A Highlander's Sword" knowing that farmer's markets are full of them. Anyway, I said it in jest as my wife was there and I know she would never let me have one. So to make a long story short, my Mom stops by today and drops off one of the fake Highlander swords... She only paid $30.00 for it, but it was nice that she still thinks and listens to her son. The sword isnt that bad, though I would never swing it as it looks like it would come apart if I did. It is the version with the open mouth dragon and red ruby type gem in the hilt. I am sure you all know the one I am talking about. Thanks for the info David, and everyone else. Every chance I get I talk about my Musashi sword here. It is great. I got #150. No no, I still have every stinkin last one of them. WWW.filmswords.com has just recently finished their prototype that they have been working on for nearly 4 years.